The market’s WTI Crude Oil traders will be engaged in looking at their rolling news screens for indicators on the trade-related headlines this week. Such news headlines could come from statistics agencies, trade talks or the gathering at Davos (January 22nd to 25th). This follows a week when prices enjoyed a third consecutive weekly gain driven by an anticipation that the U.S. and China would reach a deal to end their disturbing trade dispute. Prices gained as futures rallied 3.32% on Friday as the rumour mill went into overdrive on news suggesting the U.S. and China were reviewing concessions ahead of a Washington visit from Chinese Vice Premier Liu He at the end of the month. 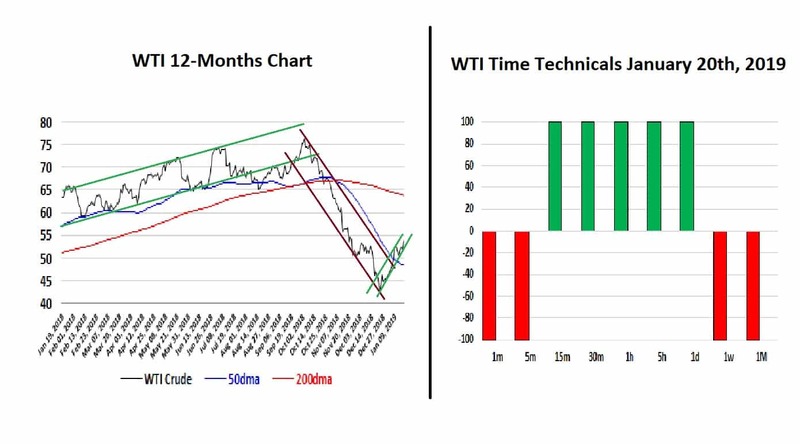 The left-hand panel in the chart above shows the past 12-months of the WTI price, and one can see that since December 24th the spot price broke out of the corrective channel that had been in place since October 18th. The left-hand panel illustrates the technical sentiment and as the trading gets underway on Monday, it would no surprise to early profit taking after the strong gains on Friday. This should yield to renewed buying before further selling into strength dominates the market once we hit weekly and monthly trade. Another factor that saw prices move higher was the largest weekly decline in the U.S. oil-rig count in nearly three-years, i.e. -2.405%, based on Baker Hughes data. After ending 2018 in freefall, oil is off to its best start in January in over 18-years, gaining 18%. However, one must acknowledge that the recent resurgence in oil prices has been driven by the confluence of improving trade prospects and a decline in global output. 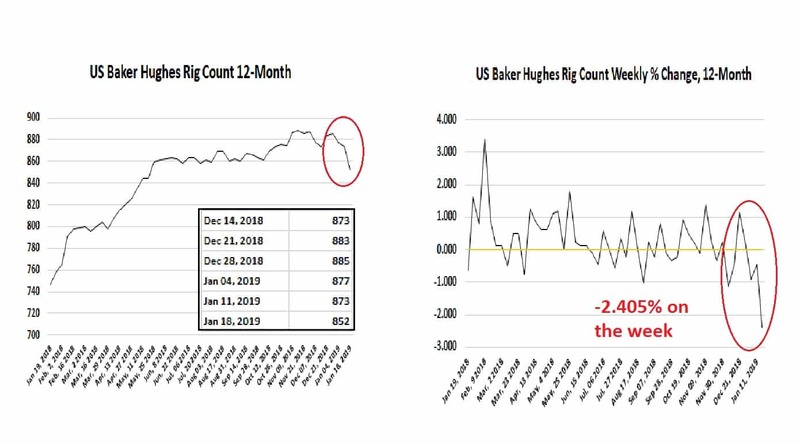 Over the past two to three years, we have seen that any time oil prices press too much higher the rig count in the U.S. scoots higher again and I would be surprised to see that pattern demonstrate its rhythmic regularity. So, sell WTI early on, with a view of a quick, i.e. within a day if not mere hours, opportunity to make profit from the short-side.